With this lunation, it might not be a bad idea to set ground rules for a code of conduct at Thanksgiving dinner. This Full Moon is in the sign of Gemini, opposite the Sun in Sagittarius. 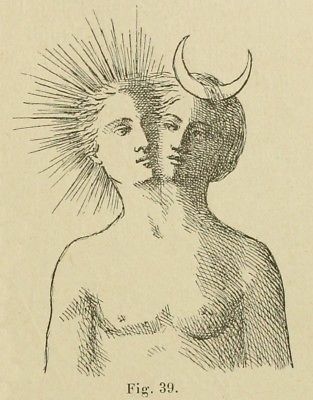 A Full Moon occurs when the Sun and Moon are exactly opposite each other by sign, representing the symbolic POLARITY that the opposing signs represent. This lunation is about taking a deep dive into the belief systems that inform our world view, turning them over, and shaking loose the broken pieces. The Gemini/Sagittarius polarity is symbolic of the analytic mind versus the intuitive mind, logic versus faith. Jupiter, the planet that rules expansion, spirituality, and growth, recently entered Sagittarius, a sign under Jupiter’s rule, and will remain there for an entire year. Jupiter plays a major role in this lunation, being closely conjoined the Sun (at 03 deg 16’ Sagittarius). Jupiter expands whatever he touches; when in balance, the energy of Jupiter can symbolize growth, but can rapidly lead to excess and unrealistic optimism if expectations are left unchecked. Mercury is also in the sign of Sagittarius at 10 deg 18’, conjoined with the Sun and Jupiter. planets in detriment usually play out in the mental and emotional arenas, translating to worry, unease, nervousness, and not feeling “at home”. Adding Mercury’s retrograde status to the mix, old ideas and dogmas can be confronted; we can spend time now reassessing what belief systems we should rethink … or throw away altogether. Mars in Pisces (at 04 deg 32’) forms a T-square with the Sun/Moon opposition, poking the fire and fanning the flames even further. If you know your ascendant (also known as the “rising sign”), read the forecast for that sign as well as for your sun sign for a more personalized view of this lunation cycle. a common interest. Just make sure to exercise caution, and watch out for the Full Moon intensity! The Full Moon in your eleventh house may signify a time when friends are more emotionally important to you than usual, and would be a good time to tell them how much they mean to you. This is also a good time to examine your goals, and ask yourself if they are truly relevent to your life now, or if they are outmoded desires you just haven't been able to let go of. Great energy for networking and focusing on group projects in general! time regarding these matters as well, and wait until after the next New Moon to move forward on them. The Full Moon in your eighth house could bring an intensity to your emotional experiences, and you may attract as well as be attracted to people that stir you emotionally. There could be a tendency for possessiveness with this aspect, but if you focus on connecting emotionally, then you can relax and trust. Merging, sharing, spiritual and metaphysical matters are highlighted for you today.